"This ... novel both skewers and celebrates small-town New Zealand.Pat `Pearly' Gates has achieved a lot in his life and evinces considerable satisfaction in his achievements. He has a reputation as a former Otago rugby player and believes he would have been an All Black but for ... read full description below. 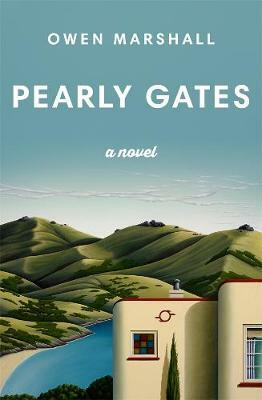 Funny, intriguing, lyrical, insightful and ultimately moving, this entertaining novel from one of this country?s best writers both skewers and celebrates small town New Zealand.Pat `Pearly' Gates has achieved a lot in his life and evinces considerable satisfaction in his achievements. He has a reputation as a former Otago rugby player and believes he would have been an All Black but for sporting injuries. He runs a successful real-estate agency in a provincial South Island town, of which he is a second-term mayor. Popular, happily married, well established, he cuts an impressive figure, especially in his own eyes. But will his pride and complacency come before a fall? And if so, how will that come about? Owen Marshall, described by Vincent O'Sullivan as 'New Zealand's best prose writer', is an award-winning novelist, short story writer, poet and anthologist, who has written or edited 30 books, including the bestselling novel The Larnachs. Numerous awards for his fiction include the New Zealand Literary Fund Scholarship in Letters, fellowships at Otago and Canterbury universities, and the Katherine Mansfield Memorial Fellowship in Menton, France. In 2000 he became an Officer of the New Zealand Order of Merit (ONZM) for services to literature; in 2012 was made a Companion of the New Zealand Order of Merit (CNZM) and in 2013 received the Prime Minister's Award for Literary Achievement in Fiction. In 2000 his novel Harlequin Rex won the Montana New Zealand Book Awards Deutz Medal for Fiction. Many of his other books have been shortlisted for major awards, and his work has been extensively anthologised. In addition, in 2003 he was the inaugural recipient of the Creative New Zealand Writers' Fellowship, and was the 2009/10 Antarctica New Zealand Arts Fellow. In 2006 he was invited by the French Centre National du Livre to participate in their Les Belles Etranges festival and subsequent tour, anthology and documentary. He was the President of Honour of the New Zealand Society of Authors, 2007-08, and delivered the 2010 Frank Sargeson Memorial Lecture. He was a school teacher for many years, having graduated with an MA (Hons) from the University of Canterbury, which in 2002 awarded him the honorary degree of Doctor of Letters, and in 2005 appointed him an adjunct professor. See more at www.owenmarshall.net.nz. Many leading contemporary writers have counted themselves amongst his admirers, including Janet Frame and Fiona Kidman, who wrote of his work, 'I find myself exclaiming over and again with delight at the precision, the beauty, the near perfection of his writing.' Writer, historian and literary biographer Michael King wrote of Marshall, 'Quite simply the most able and the most successful exponent of the short story currently writing in New Zealand.' In World Literature Today, Carolyn Bliss described Marshall as a writer who 'speaks with equal intensity to the unbearable loveliness and malevolence of life'. Writer and academic Vincent O'Sullivan has claimed 'nobody tells our New Zealand stories better'. When Gravity Snaps, a collection of short stories that was runner-up for the 2003 Deutz Medal for Fiction, was described by Gordon McLauchlan in the Weekend Herald as displaying 'the gift of telling stories that take hold of you in a personal way and bring echoes of people, places and events you have known, but not paid enough attention to at the time. It is a magical heightening of the ordinary.' The short story collection Watch of Gryphons and Other Stories, shortlisted for the 2006 Montana Book Awards, ranges over a rich variety of subjects and settings, from Perugia's ancient ruins to the South Island's empty tussocklands, and displays the nuanced emotions which typify Marshall's writing. The next collection, Living As a Moon, also shifts between European and Antipodean settings. David Eggleton wrote of Owen's poetry in The New Zealand Listener, 'Marshall weighs his words as if regarding you with a raised ironic eyebrow. The poems employ the same bluff, resilient, yet harmonious language as Marshall's prose.' Marshall's third novel, Drybread, combined elements of the thriller alongside a love story, exploring the 'ambiguities of relationships' (The New Zealand Listener). Kelly Ana Morey, reviewing his next novel, The Larnachs, in The New Zealand Herald, described it as 'a thoughtful, tender love story with ... an awful lot of lovely, restrained writing by Marshall'. The book is a fictional treatment of real events in the nineteenth century, and John McCrystal in The New Zealand Listener noted- 'The Larnachs is an interesting development for Marshall. For many years pigeon-holed as a writer of realist fiction from a masculine perspective, he has proved himself far more than a one-trick pony. He has published two volumes of poetry and The Larnarchs is his fourth novel. Half of it is written from a woman's point of view.' Marshall has compiled two anthologies, Essential New Zealand Short Stories and Best New Zealand Fiction #6, and collaborated with painter Grahame Sydney and poet Brian Turner on Timeless Land, an appreciation of the landscapes of the Central South Island, which has been published in multiple editions.